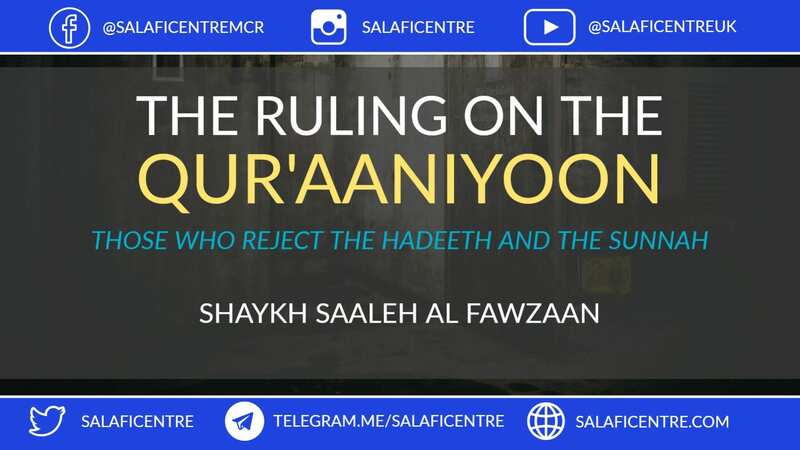 Honourable Shaykh – May Allāh give you success – this questioner says, What is the ruling on those called Qurāniyūn, those who reject the noble hadīth, and they say we suffice ourselves with the Qurān only? This is disbelief, this is disbelief in Allāh The Mighty & Majestic because the Hadīth is revelation from Allāh The Mighty & Majestic, it is the second revelation after the Qurān. Nor does he speak of (his own) desire. It is only an Inspiration that is inspired. The speech of the prophet is revelation from Allāh the Mighty & Majestic, the pronouncement is the Messenger’s, however the meaning is from Allāh. And this one says, I only take from the Qur’an. “And whatsoever the Messenger gives you, take it” He says, No, I won’t take. What sort of speech is this?! 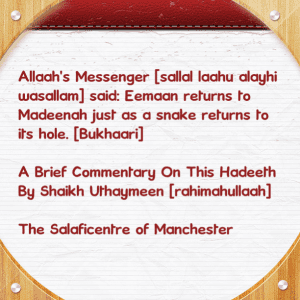 Answer: In this hadeeth the Messenger [sallal-laahu-alayhi-wasallam] said: ‘’ Verily Eemaan returns to Madeenah as a snake returns to its hole.’’ The word [ يَأرِزُ -Yarizo] with a kasrah on the letter Raa can also have a Fatha or a Dammah on the Raa. And the meaning of [يَأرِزُ – Yarizo] is that (Islaam) will return and will be established in Madeenah, just as a snake returns to its hole after exiting it. 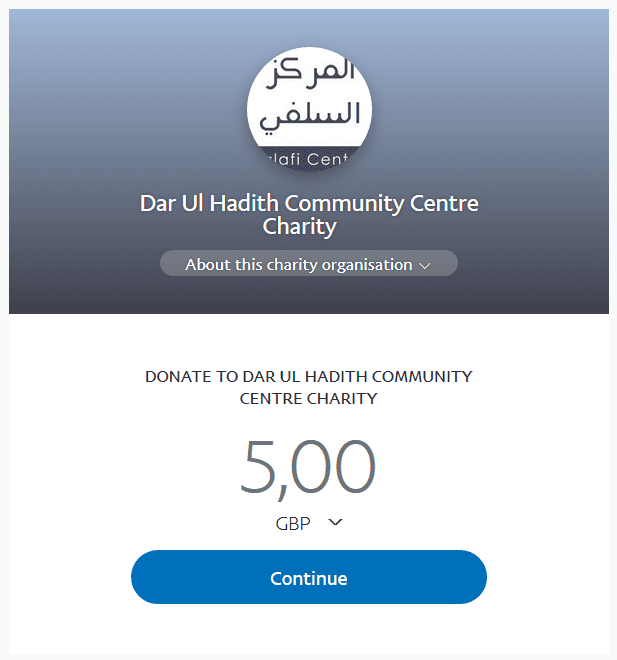 This is an indication from the Prophet [sallal-laahu-alahi-wasallam] that this religion will return to Madeenah after the other lands become corrupted, just as a snake goes out and roams about in the earth, and then returns to its hole after thereafter. 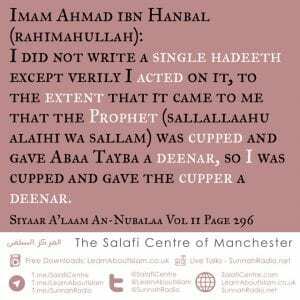 I did not write a single hadeeth except verily I acted on it, to the extent that it came to me that the Prophet (sallallaahu alaihi wa sallam) was cupped and gave Abaa Tayba a deenar, so I was cupped and gave the cupper a deenar. 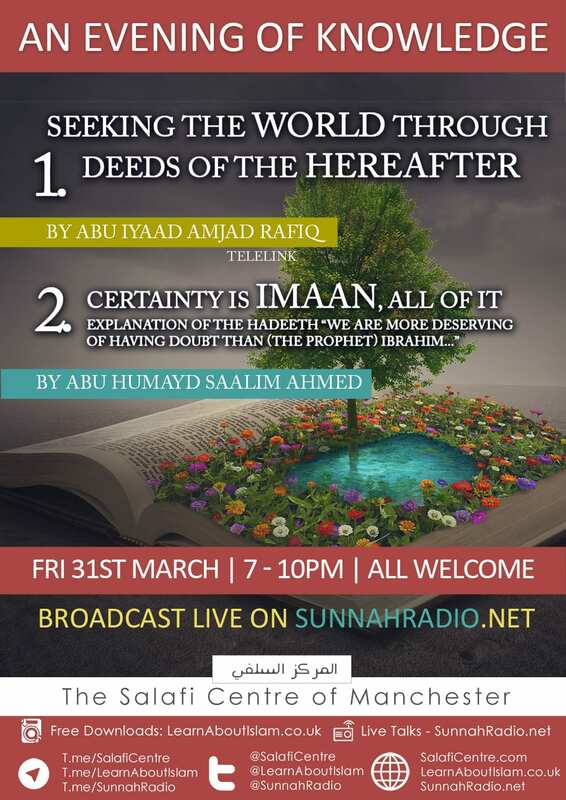  Brothers and Sisters all welcome!